Hatters striker Elliot Lee insists his side are hungrier than ever to win the title after losing to promotion rivals Accrington Stanley on Saturday. Town, who had been at the summit since late November, were undone by Billy Kee’s cruel stoppage time winner as they were beaten 2-1 and overtaken by their opponents, who claimed top spot. However, Lee, who had made it 1-1 with his 10th goal of the season, feels all the defeat has done has increased the squad’s desire to ensure they are crowned champions in May, as he said: “Of course we’re down, we’ve lost a game of football, but no-one’s panicking in there, we know how good we are, we’re hungry for that top spot again. “I don’t think it was our day. They’ve had two chances and scored two goals, you can see that we are far superior to them, but we didn’t get any points. “We know for a good part of 90 minutes we’ve passed them off the pitch, I think a lot of people can see, if you know football, we’re a much better side. “But that’s what you get sometimes, you don’t get what you deserve in football. They’ve had two chances and scored two goals, so at the end of the day we don’t get any points. “We’re all frustrated in there, we know how good we are, we’re not cocky, we’re not arrogant, we know how good we are. “We know we’re the best team in this league, but obviously the league table isn’t showing that right now, so we want to put that back right and get to the top position. “It could be a blessing in disguise, it could bring us back down to earth. We’ve had a great season so far, but we haven’t achieved anything yet. "We all want that top spot back and I don’t think there’s anything that’s going to stop us. 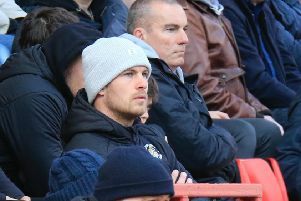 Meanwhile, Lee will use the way that Accrington celebrated their triumph at Kenilworth Road to increase his desire to have a championship winning medal around his neck at the end of the campaign as he added: “It’s horrible for any footballer to hear that, especially at your home ground. "You don’t want that in front of your fans, but that will stick in our minds and come the end of the season I’m sure we’ll be the ones celebrating. “The gaffer made a good point in there, obviously I wasn’t here, but at the Blackpool game at the end of the season, they all felt down, they couldn’t do anything about it.